Please join us on Sunday Oct. 16th for a Day of Public Performances and Explorations, as part of our current exhibition Chance Ecologies: Queens at the Queens Museum. Chance Ecologies: Queens is an exhibit of new works, artistic gestures and research projects engaging with the undesigned and wild growing landscapes found in post-industrial sites, landfills and other liminal spaces around Queens, which will be on view at the Queens Museum’s Community Partnerships Gallery from October 8th to 30th. As part of this exhibit, please join the artists and curators of Chance Ecologies on Sunday, October 16 for a day of performances and participatory explorations along the Flushing River, engaging with the wild growing landscape and layers of history in Flushing Meadows-Corona Park. This day of free public events will begin inside the Queens Museum and continue outdoors, throughout the park. The events will flow from one to the other and can be experiences as an immersion into the Chance Ecologies around the Flushing River! We hope you can join us! A public performance by Natalia Roumelioti (ntilit) with collaborators Christine Krishna Washburn, Tamio Shiraishi, Alicia Chan, Charlotte Colmant, Gabriella Garcia, Alex Korotin, and Raul Zbengeci. Based on a video exhibited in Chance Ecologies: Queens, the performance will bring participants from the museum out into the park, exploring themes of body and space, and person and environment, with choreography exploring both the visibility and invisibility of the body, and immersion of the self seamlessly into a place. A wearable artwork by the artist, currently exhibited in the museum, will be used as a central part of this performance. Location: Begins inside the the Queens Museum, at the Chance Ecologies: Queens exhibit in the Community Partnership Gallery. Ends at the Fountain of Planets/Pool Of Industry in Flushing Meadows-Corona Park. This workshop led by artist Christopher Kennedy will bring visitors to the hiway/hiway landscape he has investigated for Chance Ecologies: Queens. This free public event will be a movement research workshop and guided tour of the Flushing River, underneath the Long Island and Van Wyck Expressway. Move, dance, and respond to hidden highway ecologies. Location: Begins on the east side of the Unisphere and ends at the Flushing River, under the Long Island and Van Wyck Expressway in Flushing Meadows-Corona Park. Chance Ecologies co-curator Catherine Grau will lead a participatory walk along the Flushing River. Through a series of mediated visualizations, narrated dialogue and movement exercises, participants will be invited to embody the physical subjugation of a river to a master-planned terrain, while exploring moments of rewilding on the river’s shorelines. Location: Flushing River under the Long Island and Van Wyck Expressway in Flushing Meadows-Corona Park (continued from Hiway Safari). 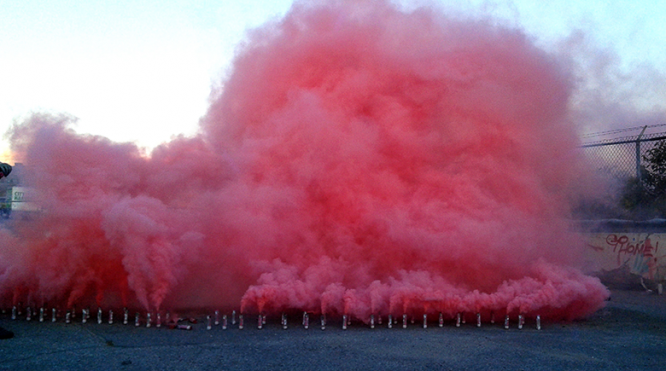 An installation by artist Raphaele Shirley, which will light 100 pink smoke signal flares in Flushing Meadows-Corona Park, building a wall of smoke that temporarily masks the landscape behind it. This ephemeral mass of color marks the appearance and disappearance of natural and urban settings as they are affected by man’s hand, offering a reflection on landscapes in distress, nature’s beauty and timelessness, and the state of emergency in our current age of Anthropocene.